Rich Elmore has posted a most excellent Health Wonk Review: Special Edition on Health Care Reform, which might also be called the “when pigs fly” edition. It has a good roundup of the health policy blogosphere’s reaction to the landmark legislation and a handy, must-see one page info-graphic of the time line. Prevention in Health Reform – at the NIOSH Science Blog, John Howard, the Director of National Institute for Occupational Safety and Health, summarizes prevention provisions in the Patient Protection and Affordable Care Act and their implications for workplace safety and health. Frequency – At Comp Time, Roberto Ceniceros looks at the way that health care reform might impact workers comp claim frequency. He explains that the data in this area is thin, but elicits some educated opinions on the topic. More grim news from China – In addition to the increasingly desperate search for 153 miners which we discussed earlier this week, Ken Ward reports that in a different China mine, 12 miners have been killed and another 32 are missing. Food processing – At The Pump Handle, Carlos Rich makes the case for food processing companies to treat workers more like humans and less like machines. We agree. Meatpacking and poultry processing plants are some of the most notorious environments for safety today. Many also play fast and loose with employment laws. Fair Warning – “…an online nonprofit publication that seeks to provide robust, public interest journalism on issues of health, safety and corporate conduct.” The publication promises investigative journalism, legal and regulatory news, and reports from think tanks, academics, and advocacy groups. Work Safety Blog from Blog4Safety – bills itself as “Your online resource for safety information, safety tips, and safety compliance.” It’s not a new blog, posts go back to 2008, but it is a new discovery for us. The blog is sponsored by The blog content has been provided by Texas America Safety Company (T.a.s.c.o.). 9/11 suit back to bargaining table – Southern District of New York Judge Alvin K. Hellerstein surprised a lot of people when he rejected the proposed $575+ million settlement for 9/11 first responders. His complaints? The settlement paid to victims was too little. Read more from law.com: 9/11 Lawyers Return to Bargaining Table to Refine Settlement. Putting a Dollar Figure on a Doctor’s Worth to a Hospital – WSJ’s Health Blog offers a chart of a doctor’s worth to a hospital in terms of annual revenue. April is Alcohol Awareness Month. See Drug Free Workplace Kit from the Center for Substance Abuse Prevention, Substance Abuse and Mental Health Services Administration. Workers Comp will not be federalized. Period. Joe Paduda tells us why at Managed Care Matters. Top 10 office annoyances – SafetyNewsAlert gives us the rundown on what bugs your colleagues. Massachusetts has recently announced an online tool to verify that an employer has workers’ compensation coverage. The tool can be accessed from the Department of Industrial Accidents site. While most states have some type of anonymous fraud reporting system on their websites, some states are getting more aggressive than others in promoting their services to the public. Florida has been touting the results of their workers comp whistle blower site, which allows citizens to submit referrals of alleged violations of workers compensation rules. As of August, after only two months of operation, the site had already produced hundreds of new complaints and over $500,000 in penalties. Fraud reporting systems aren’t just for reporting noncompliant employers. They can also be used to report suspected employee, physician, or attorney fraud related to workers comp. According to the National Insurance Crime Bureau, workers comp fraud referrals were up by 2% in the first half of 2009. Premium fraud was down by 21%, but other types of fraud such as medical provider fraud and claimant fraud have risen. Steve Tuckey is currently writing an in-depth series on fraud for Risk and Insurance. The first installment, Transparency of Evidence, deals with fraud by doctors, hospitals and other healthcare professionals. He notes that “grayer areas of so-called abuse or overutilization continue to vex payers, insurance companies and lawmakers eager to maintain the financial stability and integrity of the system that has protected workers for nearly a century.” Evidence-based medicine standards are helping to curtail both the egregious fraud as well as “softer” abuses. Part 2, Vanishing Premiums, deals with the issue of premium fraud and the myriad schemes employers use to avoid paying their fair share. Some employers and insurers are finding that social networking sites are a useful new tool in com batting employee fraud. In fact, in many cases, fraudulent employees are outing themselves as cheats by bragging about false claims or posting photos or videos of themselves engaging in activities that are incompatible with the injuries they are claiming. “Some claimants supposedly too disabled to work post locations and dates for their upcoming sports competitions or rock band performances, boast of new businesses launched, and include date-stamped photographs of their physical activity, investigators say. Fire the Smokers! Tax the Fat? Back in December of 2006 we blogged the story of Scott Rodrigues, a new hire of the Scotts lawn care company, who was fired after failing a drug test. No news here, perhaps, except that the drug in his system, nicotine is perfectly legal. Scott’s is self-insured for health benefits, so they have a vested interest in making sure that employees follow basic wellness practices. On his way to a pre-placement drug test, Mr. Rodrigues chewed on Nicorette gum. He was trying to kick the habit. Ironically, the Nicorette may have triggered the positive finding for nicotine. Rodrigues was hired provisionally and then abruptly terminated once the test results were released. Rodrigues brought suit in federal court for violation of privacy and civil rights. Judge George O’Toole has ruled in favor of the company. The judge found no violation of privacy laws, as Rodrigues smoked while walking down the street and in a restaurant parking lot. His supervisor spotted a pack of cigarettes on the dashboard of his truck. Would the judge have ruled for Rodrigues if the employer had peeked through a window to see him smoking at home? O’Toole also rejected the notion that the firing violated a 1974 federal law that protects employee rights to benefits. O’Toole ruled that Rodrigues was not yet a bona fide employee and was working on the condition that he pass the urinalysis. Jim King, a spokesman for Scotts, said the smoking ban has never been used to fire an “existing” employee. It is used solely to screen out applicants. Since the ban went into effect in 2005, the percentage of smokers among the company’s 7,000 employees has fallen to 7 percent from 28 percent. Whether employees can smoke or not depends upon the state they work in. A few states (e.g., Kentucky, Louisiana) explicitly protect smoker rights. Other states do not. It’s interesting that Rodrigues pursued his case in federal court, probably because Massachusetts laws offered no protection to smokers. We all know that smoking increases the risk of illness and the cost of medical coverage. The same goes for obesity. So the next front in the battle to control the business side of medical costs may well be the bathroom scale. The New York Times magazine profiles the Cleveland Clinic, which has been upheld as a model for medical cost control. Two years ago, they stopped hiring smokers. Delos M. Cosgrove, the heart surgeon who is the clinic’s chief executive, would like to expand the hiring ban to include applicants who are obese. A recent article in Health Affairs estimated the annual cost of obesity to be $147 billion and growing. That translates into $1,250 per household, mostly in taxes and insurance premiums. Cosgrove is interested in an idea that some economists favor: charging higher health-insurance premiums to anyone with a certain body-mass index. Call it the Fat Tax. Another alternative might be taxing the calorie-rich foods that lead to obesity: just imagine paying a little surcharge for your large order of fries, your jumbo soda and your two-for-one pizza. That would be interesting, indeed! Just as smokers pay a tax-driven premium for their cigarettes, eaters would be taxed for their food addictions. This is simply not going to happen. To be sure, fundamental wellness is the cornerstone of any plan to contain health care costs. But when the public good collides with the rights of freedom and privacy, individual rights will win out. Policy wonks may not like it, but citizens can eat whatever they damn well please. Lighting up after that supersized meal? Well, that’s one area where the public good pretty much trumps the private right. Developed by the Cytokine Institute, a research and consulting firm affiliated with the University of Illinois College of Medicine at Chicago, the technology uses DNA to determine a link between exposure to a toxin and a serious illness. It does so by identifying a toxin’s unique DNA signature on a person’s affected cells. The technology, launched in June, has already been used in two dozen civil lawsuits between workers and insurance companies to verify the connection between exposure to toxins and a serious illness, says CEO Bruce Gillis, a doctor specializing in medical toxicology. “It will get rid of all the nuisance and frivolous lawsuits once and for all,” Gillis says. In addition to the application for illnesses and exposures to toxins, testing may also be able to tell if an injury has even occurred. The Workforce article also discusses technology that can measure cytokines or small proteins in a person’s cells, which elevate when an injury occurs. Cytokines can be measured as a before and after baseline to verify that an injury has occurred. Before you get too excited, you might check in with your lawyers, many of whom are likely to advise caution due to potential problems with privacy and discrimination issues. While there are no federal prohibitions against genetic testing, at least 30 states have laws that may say otherwise. HR Hero sheds light on the status of federal legislation putting limits on genetic testing in Lifeguard on duty: Congress patrols the gene pool, excerpted from Arizona Employment Law Letter. While many of the legal prohibitions deal with matters related to hiring discrimination and insurance denial rather than work injuries, attorneys advise a conservative approach in matters dealing with employees’ genetic information. Genetic testing is already a hot button employment issue. 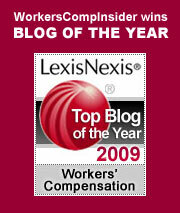 Its application to workers’ compensation and other disability matters is an issue that bears watching. For a handy reference guide, the National Conference of State Legislatures offers a chart on State Genetics Employment Laws.